After a long day on the trail, you may have some pretty hungry kids. This is a great carb load – although you can add some veggies too. 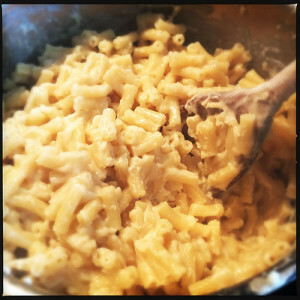 My son made this recipe last night and it is one of his favourites. Many campsites that you stay at will have the basics in the shop, or if you are wild camping, you will have to carry them in and out. Either way the ingredients are pretty basic staples, and as such you will probably have them anyway. * A good tip for cooking over a campfire is to soap your cooking pans with fairy liquid before you put them on the fire. This way the flames and soot don’t blacken the metal and can be easily washed off. Serves 4 and cooks in 20 mins, you will need a large campfire pot (billy can) for the pasta and another for the sauce, large spoon and oven glove (so you don’t burn your hands). 1. Place the large pan on the fire to start the water boiling. As soon as it has started boiling place in the pasta. 2. Melt the butter in the pan for the sauce then add the flour to make a roux. 3. Slowly pour the milk into the roux stirring continuously. 4. Keep stirring the sauce until it has thickened. 5. Take the pan with the sauce off the heat and slice in the cheese, and stir until it has melted. 6. Once the pasta has cooked, take off the boil and drain. Keep covered with a pan lid. 7. Stir the sauce into the pasta and serve with extra cheese grated on top.